This 15,000 square-foot facility is located on a site near the Pee Dee Education Center on the campus of Francis Marion University. The $3.5 million building includes a child-care wing of two infant rooms, two toddler rooms, two rooms for the three- and four-year-olds, and two rooms for four- and five-year-olds; an office area for psychology and education faculty members; a central lobby and library that functions as a family waiting area; observation and assessment rooms; and an outdoor play area. 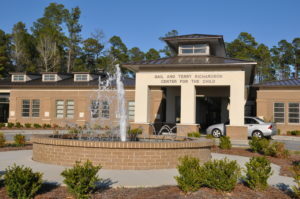 Having opened its doors in August of 2008, the children and the Center are growing together, offering a class for each age group including infants, toddlers, twos, threes and fours. Please contact the Center from 7-6 Monday through Friday to check for available spaces. Applications for admission are available at the Center during operating hours and may be submitted at any time. A registration fee is necessary to be considered for open positions. The First Steps (Pre4K) program is offered on a first come first serve basis.